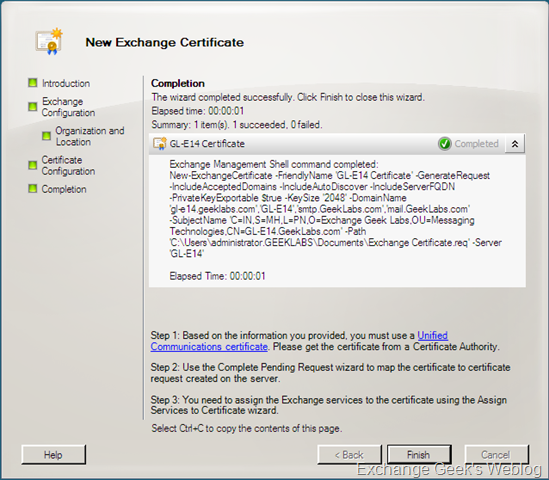 This is the second part of the blog entry Exchange 2010 EMC and Certificate Management in the previous post I wrote about creating a certificate request and the limitations of the new certificate request wizard. 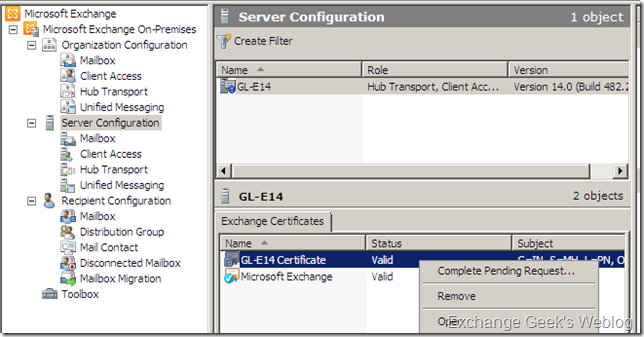 In this part we will be looking at obtaining a new certificate and then installing it on the server. 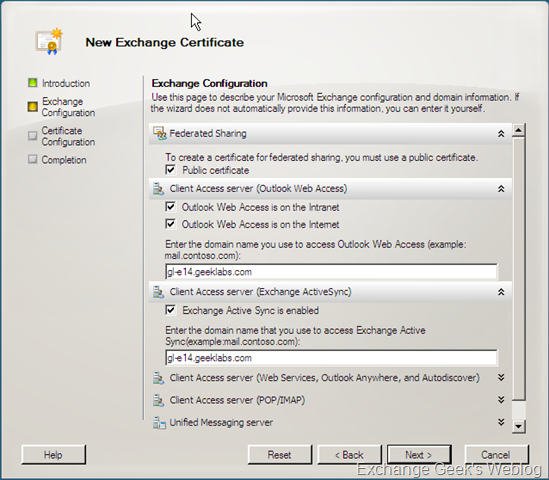 When a new Exchange Server 2007 role is installed on a computer the server automatically generates a self signed certificate to be used with services like transport (SMTP), POP, IIS (OWA and Exchange Web Services) and IMAP. 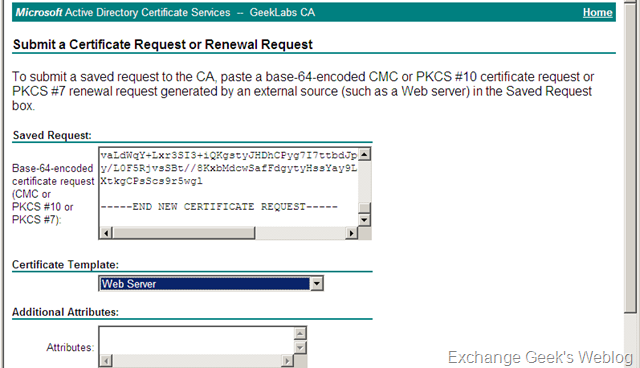 This certificate expires right after the completion of one year from the date server was installed or the certificate was reassigned manually. 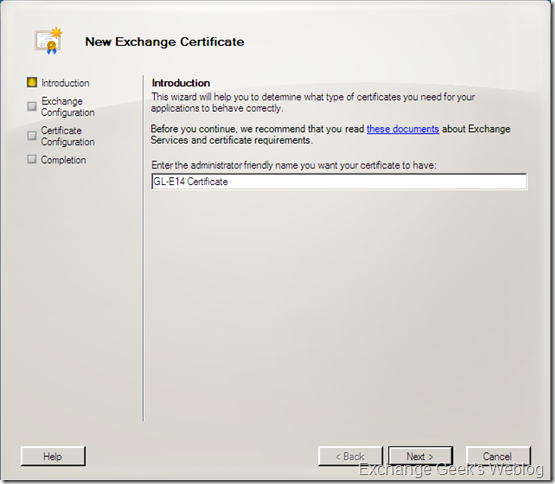 To check the status of the certificate using Exchange Management Shell. 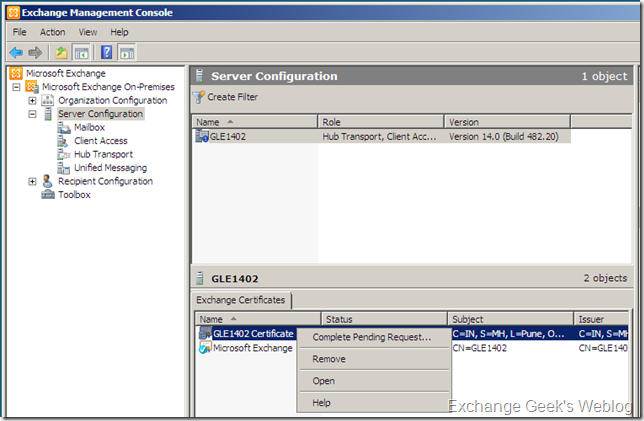 Executing the cmdlet Get-ExchangeCertificate |FL displays all relevant information about all the certificates assigned, enabled and being used or not used by Exchange Services. You may see more than one certificate listed on your exchange server(s) and that may be simply because you or someone else from your team have already tried working with certificates on the server. 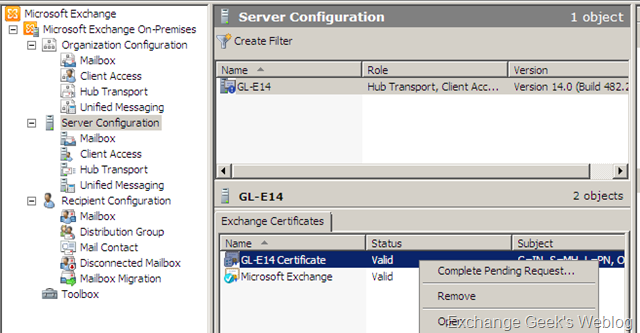 If you see the above picture, you will notice that the certificate I have on my server is valid till 24th March 2010. 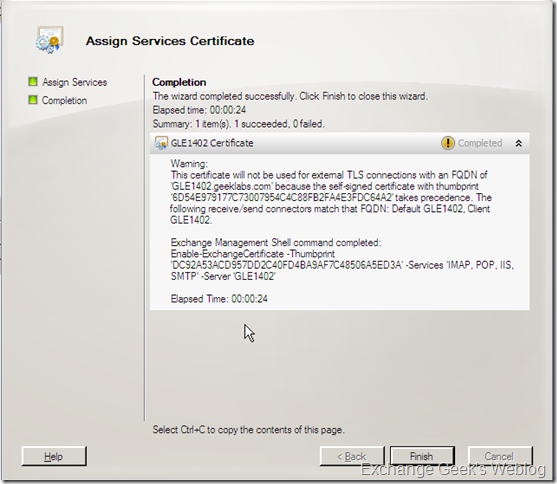 NotAfter holds the value in mm/dd/yyyy h:mm:ss format.NotAfter – means this certificate will not be valid after the time stamp listed in this field. 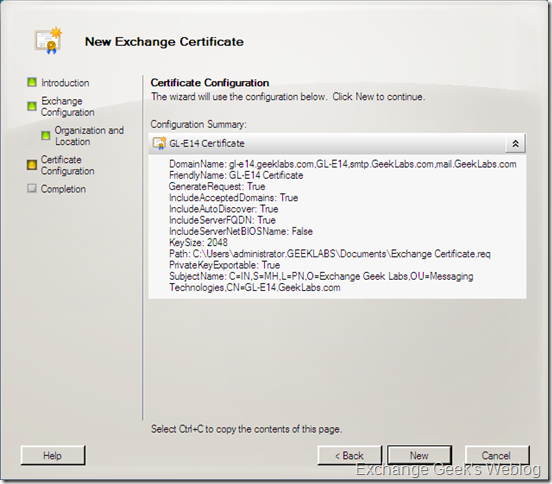 On the other hand the value NotBefore – means that this certificate will not be valid before the time stamp mentioned. 1. 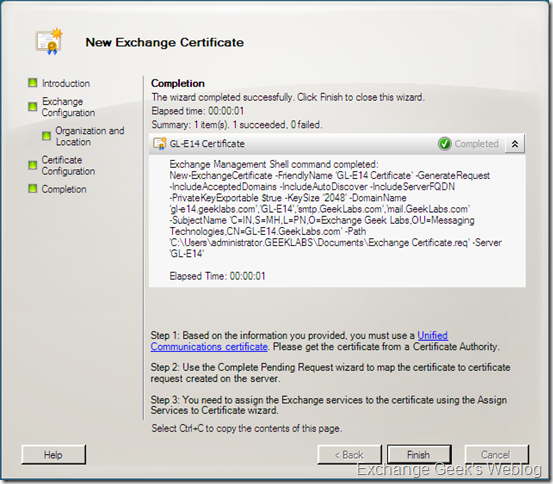 Run Get-ExchangeCertificate |FL – This will list details of all certificates that you have assigned to Exchange Services. 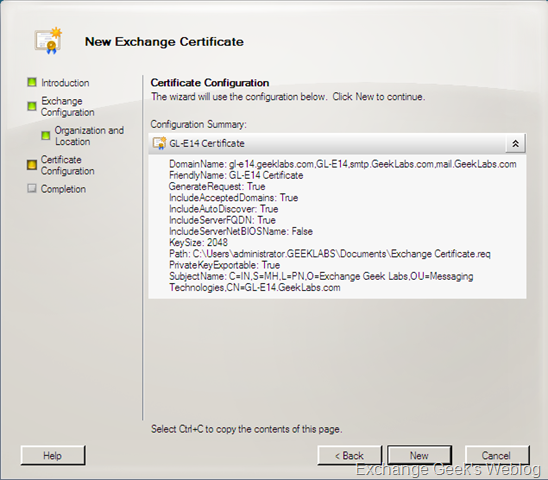 Please understand, this cmdlet does not retrieve any information about any other certificate from local certificate store which is not used by Exchange. Once you get the output printed on the screen; note down theThumbprint of certificate into a notepad. 2. 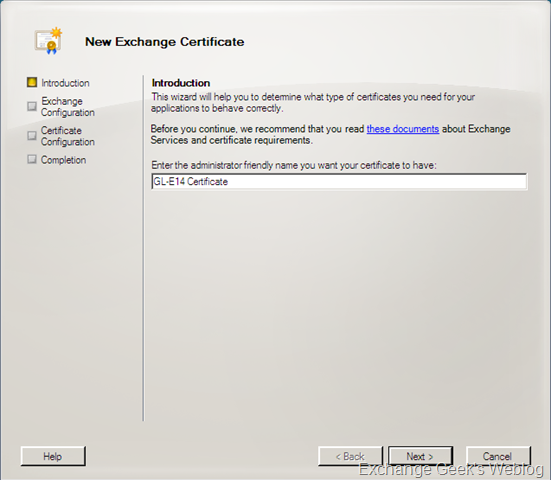 Run Get-ExchangeCertificate –Thumbprint “58C846DEEA2865CA9E6DD4B42329A9AC994EBF63” | New-ExchangeCertificate . This renews the certificate. You will notice the moment you press enter on keyboard you may be prompted to confirm if you want to use the same certificate for SMTP service. 3. Check if the certificate is renewed. 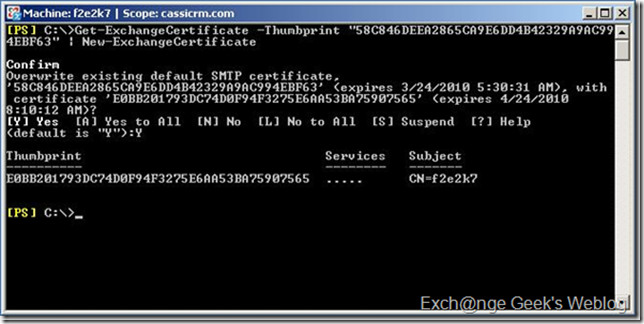 This can be simply examined by looking at the changes in thumbprint of the certificate after running the cmdlet mentioned in step 2. You can see the changed thumbprint in below picture. 5. 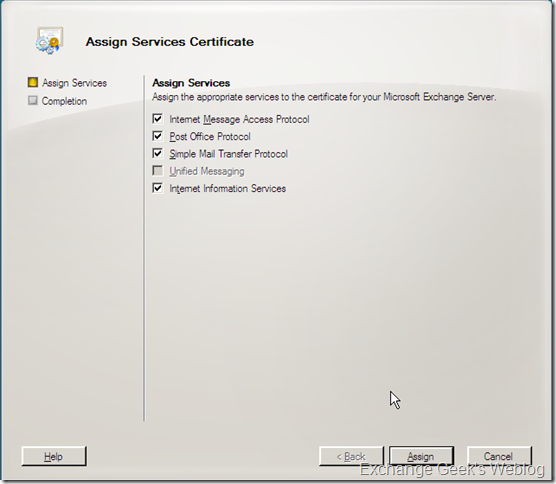 Verify all the services are working correctly after renewing and enabling the certificate. Doch! Es geht schon lange! Aber nicht über eine direkt in Google Mail implementierte Funktion, sondern über die Browser-Erweiterung "Boomerang" - die gibt's bislang für Firefox 3.6+ und Google Chrome 5.0+ (sowie für MS Outlook und in einer Mobile-Variante). Manchmal müssen Group Policys nur angewendet werden, wenn bestimmte Bedingungen erfüllt sind. 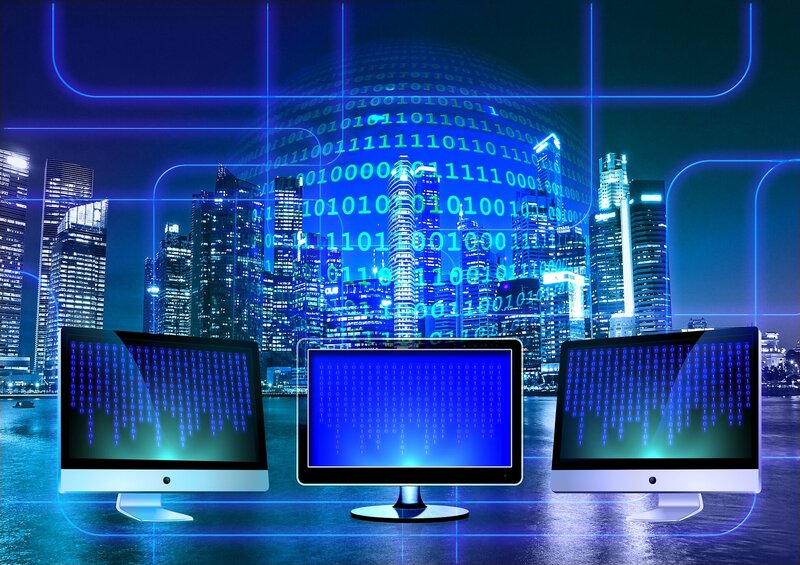 Beispielsweise eine bestimmte Software ist installiert, ein bestimmtes Betriebsystem, ein bestimmtes Computermodell etc. 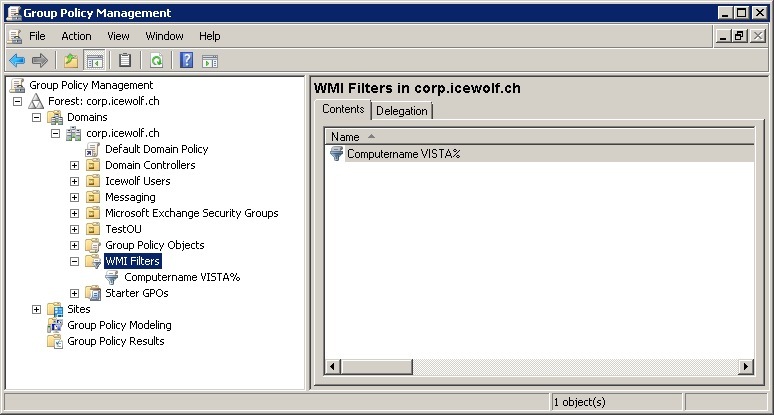 Dies kann über WMI Filtering in Group Policys erreicht werden.In meinem Beispiel soll die Gruppenrichtlinie nur angewendet werden, wenn der Computername mit VISTA* anfängt. Nun muss die GPO noch mit der richtigen OU verlinkt werden. So, nun gehts ans testen... Auf einer VM starte ich gpupdate - da der Computername nicht mit VISTA anfängt zieht die GPO nicht. 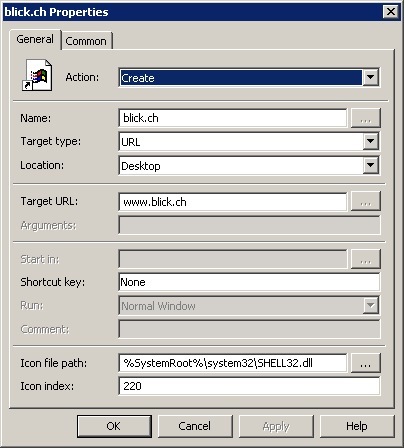 Auf dem Computer welcher dem WMI Filter enspricht, wird der Link jedoch erzeugt. I am sure a lot of you have found these posts helpful. All of these posts however did not talk about the certificates issued by public CAs. 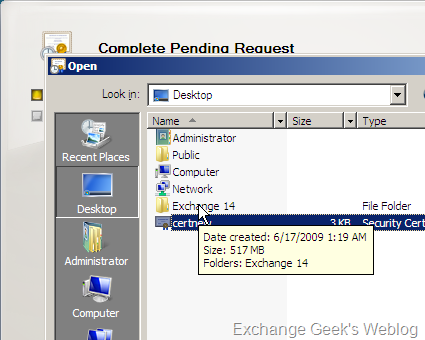 I thought it would be even more helpful to put up a separate post that would talk more about the certificate renewal process in Exchange 2010 which indeed would cover few steps for Exchange 2007 certificate renewals as well. So let’s have a look at what is it and how to do it! 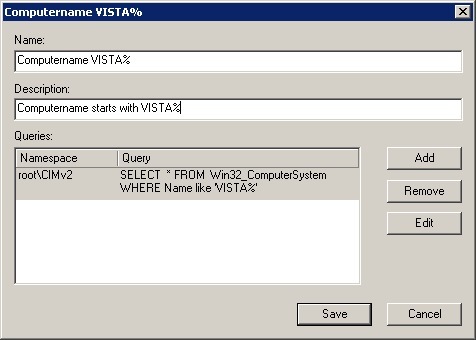 Provide the path in the wizard that appears which will save you a .req file. 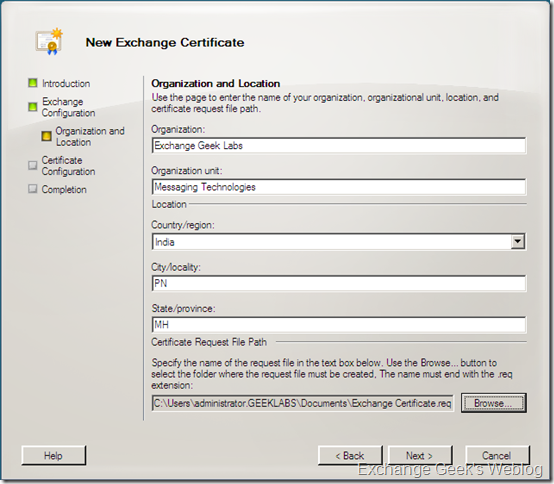 Once you have completed the wizard you are ready to use this .req file to be supplied to any certification authority that supports your request. The reason I said ‘any CA that supports your request’ is because, some CAs do not support SAN extensions supplied in the request. The above command displays the CSR that you need to be supplied to the CA. Copy the CSR and paste it to the CA interface. 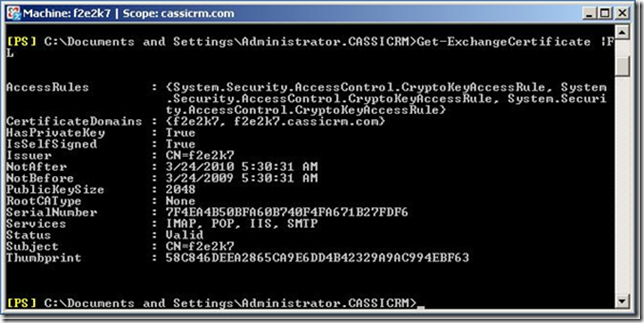 Once you have downloaded the certificate issued by the CA use below command to import it. You need to make sure that you have not removed the certificate request generated by your last operation using EMC or powershell. 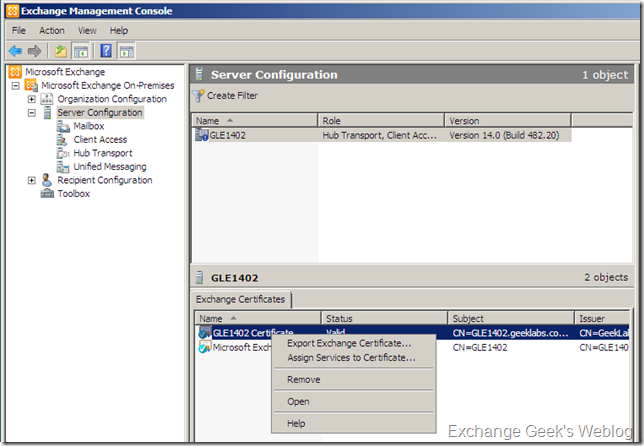 This will lead you to another situation where you wouldn’t be able to import the certificate. 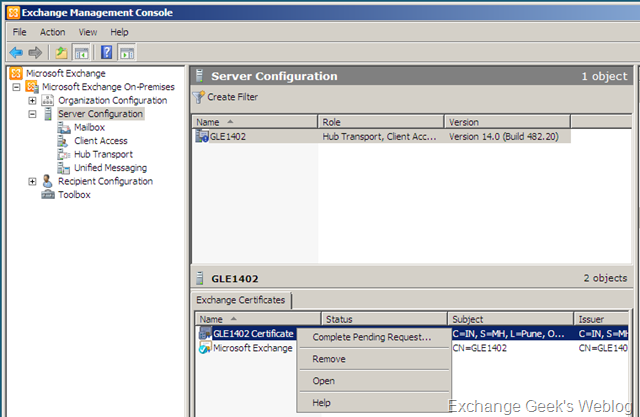 Same procedure applies to Hub Transport Server Role certificate renewal as well but the Edge Transport Server Role. 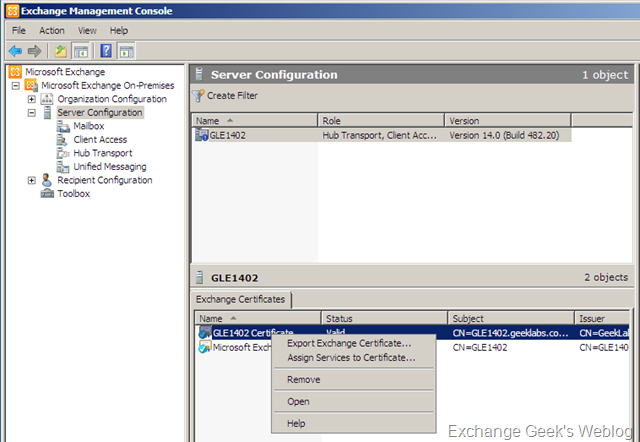 To manage certificates on the Edge Transport Server Role you must be logged on the server and use powershell. Apple liefert die Mac Mini Server zwar mit 2 500 GB Festplatten aus, allerdings sind diese noch nicht im Raid vorkonfiguriert und DVD Laufwerk ist keines vorhanden. Nach ein wenig Recherche habe ich jedoch rausgefunden wie sich das RAID per Commandline nachträglich konfigurieren lässt ohne die ganze Installationsprozess durchzuführen. Ich empfehle Euch den Raid gleich vor der Endkonfiguration des vorinstallierten Systems zu erstellen, da der Server sonst erheblich länger benötigt um die Platten zu spiegeln. Auf einem entfernten Mac (der sich im selben Netzwerk wie der Server befindet) kann unter “Programme” -> “Dienstprogramme” -> “Enternte Mac OS X Installation” gestartet werden. Mit diesem Programm lässt sich über das Netzwerk die beigelegte Snow Leopard Server Installations DVD am Mac Mini mounten. Auf dem Mac Mini muss man nun beim Starten die “Alt” Taste betätigen und nach einigen Sekunden sollte die entsprechende Server Installations Disk zur Auswahl stehen. Diese wird dann über das Netzwerk gebootet. Unser Volume “Server HD” ist hier mit dem Identifier “disk0s2″ und das Volume “Macintosh HD2 als “disk1s2″ aufgeführt. Da der Wert variieren kann und nich bei jedem System gleich ist empfehle ich euch die Bezeichnungen zu notieren. Am Ende der Ausgabe erscheint nun eine neue “Server HD” “disk9″. Die beiden Festplatten sind nun im Raid1 Verbund und das System beginnt die Daten zu replizieren. Der Vorgang kann einige Zeit in Anspruch nehmen. Mit folgendem Befehl kann der Rebuild Status überprüft werden. Achtung: rebootet den Server auf keinen Fall bevor der Rebuild Prozess abgeschlossen ist. When you are using a Gmail account over IMAP in Outlook, you’ll also automatically get an [Gmail] or [Google Mail] folder containing all the “system folders” of Gmail itself. To break yourself out of this additional subfolder and have all these folders listed directly under your mailbox in Outlook, you can set a root folder for your Gmail IMAP account. However, this has an effect on any Labels that you might use in Gmail. Luckily, there is a workaround for this as well. Double click on your Gmail IMAP account to open the account settings. 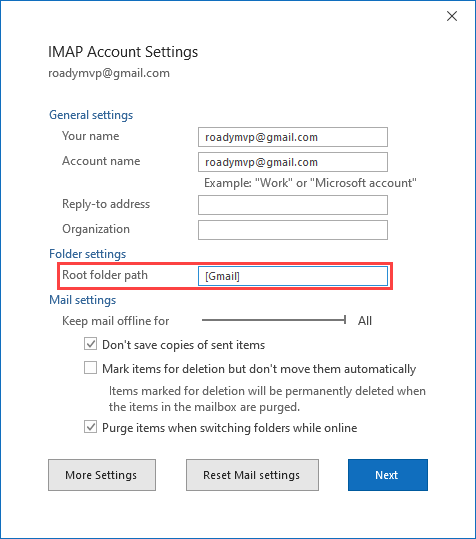 Setting the Root folder path in your IMAP account settings. After setting the option and confirming your way out of all of the opened dialogs, you’ll get a notification that your IMAP cache needs to be rebuild. In some cases, you’ll need to set the Sent Items and Deleted Items folder for the Gmail IMAP account again. Setting a root path for your Gmail account will free you from the [Gmail] folder structure. Since you are now using [Gmail] as the mailbox root folder and Labels are created on a higher level, you won’t be able to see your Gmail Label folders in Outlook. A way around this is to prefix each of your Labels with [Gmail]/. 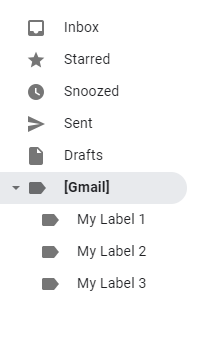 So a label called My Label 1 should be renamed to [Gmail]/My Label 1 via the Gmail web interface. Instead of prefixing your Labels, you can also create a Label called [Gmail] and configure My Label 1 as a nested Label of the [Gmail] Label. Prefix your labels with [Gmail]/, or make them a nested label of the [Gmail] label in the web interface, will make them available in Outlook again. Note:Any changes you make to the names and the structure of your folders via the Gmail web interface won’t be visible in Outlook until you restart Outlook. 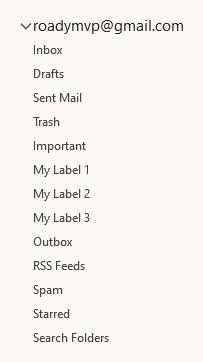 As you are now working of the [Gmail] root folder in Outlook, you’ll see all your Labels directly under your main mailbox. This might end up being a long list and make the Gmail “system folders” harder to recognize (now you know why they grouped them under a [Gmail] folder ). To solve this, create another Label under the [Gmail] Label in the web interface and call it for instance “Labels”. Now you can make all your own Labels a nested Label of the Labels folder. As an alternative, you can also prefix your Labels with [Gmail]/Labels/ since the / character is being used as a separator to indicate a subfolder. 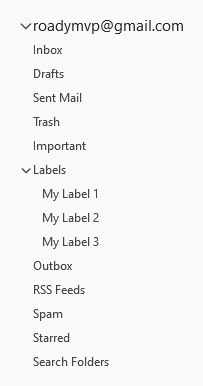 Prefix your labels with [Gmail]/Labels, or nest them under Labels in the web interface, will group them together in Outlook. 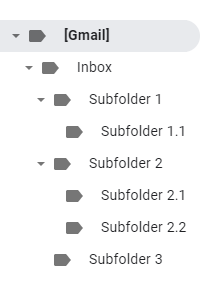 Gmail itself doesn’t really use/understand the concept of subfolders; everything is a Label. 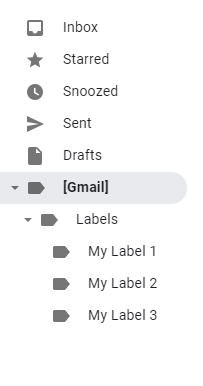 If you were to create a subfolder under the Inbox folder, you’ll actually be creating the Label INBOX/My subfolder in the web interface of Gmail. 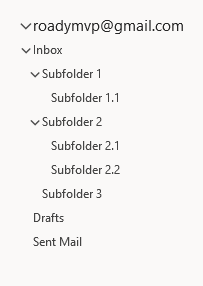 Unlike any INBOX/name subfolders, folders prefixed with [GMAIL]/Inbox/ will show up in Outlook as a subfolder of the Inbox folder even when the mailbox is rooted to [Gmail]. Prefix your labels with [Gmail]/Inbox, or nest them under the Inbox label in the web interface, will allow you to create subfolders under the Inbox folder. 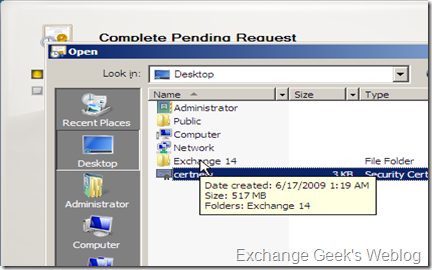 This is only required for any folder which should be a direct subfolder of the Inbox folder. 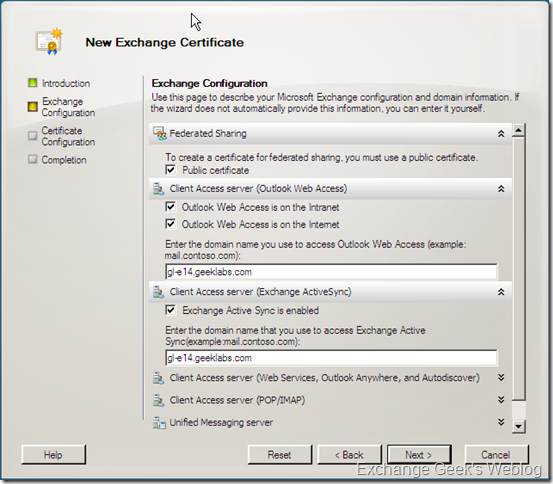 Any subsequent subfolders can be directly created in Outlook without errors. 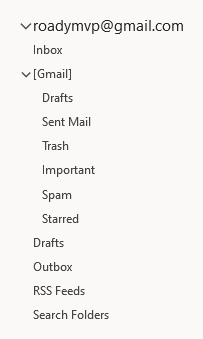 However, in the web interface of Gmail, this folder will be created with the name “INBOX” instead of “Inbox” which could separate the folders again in Outlook after a restart. In that case, you’ll have to rename the “INBOX” part of the label to “Inbox” in the Gmail web interface and restart Outlook. How useful is this change? Well, if you are also often using the web interface of Gmail and are a heavy user of Labels, I’d say it is not very useful at all. 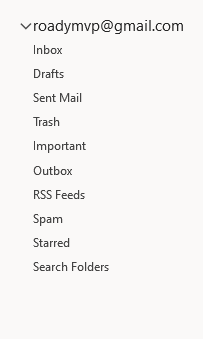 After all, instead of having the [Gmail] folder structure in Outlook, you’d then have it in the web interface. Combine that with the amount of work it is to set it up and the 40 character limit of Labels (including the characters of parent folders! ), it’s probably not worth the trouble. However, if you mainly use Outlook (or any another mail client for that matter), sort your mail into subfolders and don’t really care about the Gmail web interface and its Labels, setting a root folder would make sense. 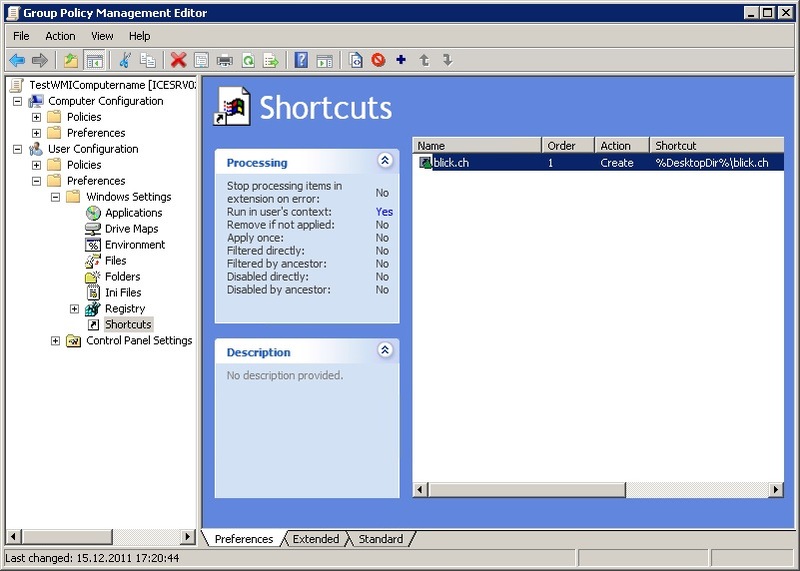 The result would be a flatter and more consistent folder structure in Outlook. den Schlüssel MobilityCenter erstellen. Danach erstellt man einen DWORD mit dem Namen NoMobilityCenter und weist den Wert 1 zu. Um das ganze wieder rückgängig zu machen, ändert man den Wert auf 0, oder löscht den Eintrag wieder.